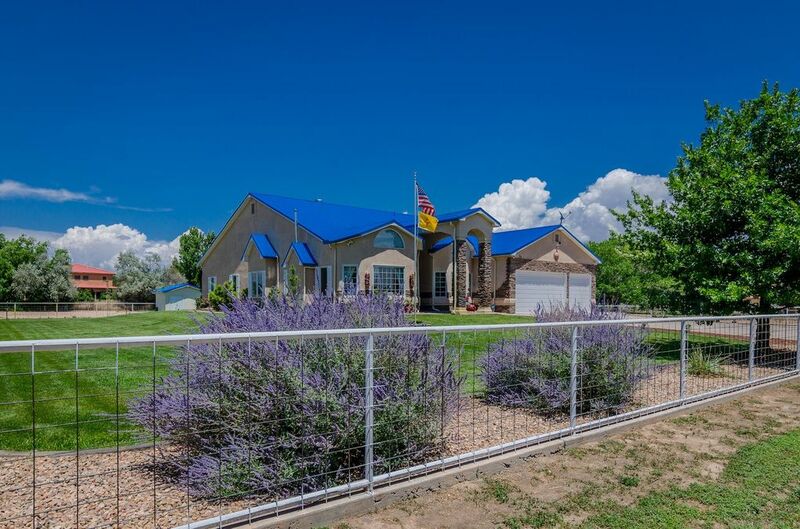 Extraordinary Northern New Mexico style custom home in exclusive Berryhill Farms Estates. Wonderful horse property with bright open floor plan on corner lot. Grand entrance with cathedral ceiling and exquisite natural light. 3 fabulous bedrooms and an office. Two living areas with formal dining room are a perfect layout for an enjoyable evening of entertaining. Master Suite has lovely bench window seat, two walk-in closets, 2 vanities, separate shower & garden tub & opens to beautiful back yard. Covered patio with fans is great place to relax with family & friends. Fully piped cross fenced lot w/barn and 2 separate horse stalls, hayloft and round pen. Metal roof and oversize 3-car garage. Natural gas. Refrigerated air will keep you cool all summer long. Hurry to see this fabulous home!